The Honourable Lt. Gov. 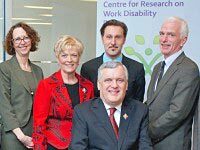 David Onley called for more hiring of people with disabilities at the February 4 launch of the Centre for Research on Work Disability Policy, being led by two IWH senior scientists. The launch received a flurry of media attention—from the Toronto Star and St. John’s Telegram to various CBC Radio programs. 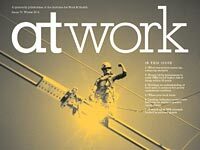 Our Winter 2014 issue of At Work is out! Learn about the effectiveness of different methods of ergonomics training. Read about including grey literature in systematic reviews. Find out how three hospitals implemented a new regulation requiring safety-engineered needles. You get this and more in the Winter 2014 issue of At Work. 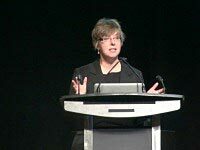 Delivering the 2013 Alf Nachemson Memorial Lecture, Dr. Mieke Koehoorn of the University of British Columbia shared insights gained through her work with the Partnership for Work, Health and Safety, a collaboration between UBC and WorkSafeBC to use workers’ compensation data for research. Dr. Emile Tompa and his research team have won the Applied Ergonomics Best Paper Award for 2013. The winning paper looked at a participatory ergonomics intervention in a textile plant. The award, announced in January, goes out every year to the paper that best demonstrates the application of ergonomics in a clear and interesting fashion. 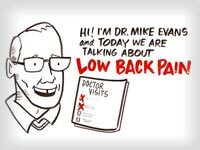 Dr. Mike Evans of St. Michael’s Hospital, creator of the popular YouTube video “23 and 1/2 hours” (with over 3.5 million views), has turned his attention to low-back pain. 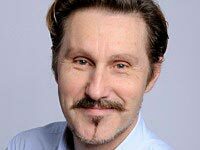 IWH evidence informed the messages in his latest video—a helpful resource for workers with low-back pain.